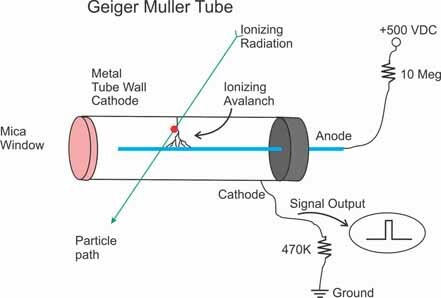 Geiger Mueller tubes are simple devices that detect and measure radioactivity. The original design by H. Geiger and E.W. Mueller in 1928 hasn't change very much. The basic sensor functioning remain the same. A cut away drawing of a typical Geiger Mueller (GM) tube is shown in Figure 2. The wall of the GM tube is a thin metal (cathode) cylinder surrounding a center electrode (anode). The metal wall of the GM tube serves as the cathode of the GM Tube. The front of the tube is a thin Mica window sealed to the metal cylinder. The thin mica window allows the passage and detection of the weak penetrating alpha particles. The GM tube is first evacuated then filled with Neon, Argon plus Halogen gas. Our GM tube is put into an initial state (ready to detect a radioactive particle), by applying + 500-volt potential to the anode (center electrode) through a ten mega ohm current limiting resistor. A 470K-ohm resistor is connected to the metal wall cathode of the tube and to ground. The top of the 470K resistor is where we see our pulse signal whenever a radioactive particle is detected. In this initial state the GM tube has a very high resistance. However, when a radioactive particle passes through the GM tube, it ionizes the gas molecules in its path and creates a momentary conductive path in the gas. This is analogous to the vapor trail left in a cloud chamber by a particle. In the GM tube, the electron liberated from the atom by the particle, and the positive ionized atom both move rapidly towards the high potential electrodes of the GM tube. In doing so they collide with and ionize other gas atoms, creating a momentary avalanche of ionized gas molecules. And these ionized molecules create a small conduction path allowing a momentary pulse of electric current to pass through the tube allowing us to detect the particle. This momentary pulse of current appears as a small voltage pulse across the 470 K ohm resistor. The halogen gas quickly quenches the ionization and the GM tube returns to its high resistance state ready to detect more radioactivity.